That background tile is much nicer indeed! 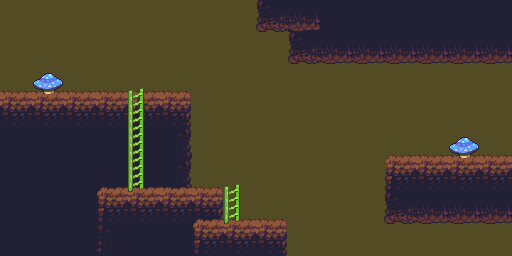 I tried to base my original (can't find it anymore) cave background also on Cave Story, but this is much better! Perhaps the dark lines need to go though! I modified your cave background tile to be less harsh. Also some alt color palettes. Let's get this set to look like this one soon! @Grimsane: Sorry, I did not include your ruins, they do not match the style guide so well. Ruins would be welcome though! I made some mockup with the BG, and although it looks nice it is also a bit distracting. What do you guys think? Should there be a background image or a flat color? Well, Imho, a flat background wouldn't be very exciting in a game. Now, given the palette restriction it seems like we don't have the proper colours around to provide convincing, readable background anyway. But the same happened somehow with the "jungle" set, where there's a placeholder blue screen. I guess the best approach might be to consider the background as "out of the scope of the OPP", and let people working on game X using OPP pick their own background picture with the palette they want. Terribly sloppy edit. Taking some contrast out of the background. Not sure if it works well, though.
. But the same happened somehow with the "jungle" set, where there's a placeholder blue screen. Actually I think the blue screen works very well as 'sky', there is some talk about clouds which could be floating in the background and I specifically hope that there will be many tree elements to fill up a lot of space with! Such as for example the leaf background. However, I think it is all solved if we go with the tile in Crow's edit! It looks nice and allows sprites to still be readable! 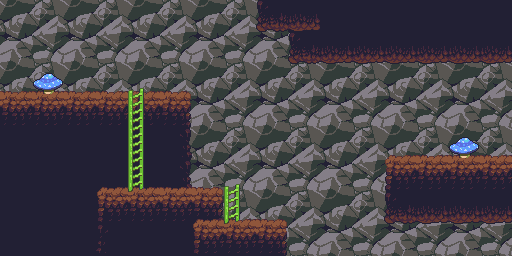 I made some stone/rock walls, probably too noticeable for a background, but whatever. EDIT: So everyone ignores my addition and then subtly doesn't include my tiles in the release. Hapiel: I've implemented your mockup. See the engine post on pixeljoint for the download. I'm afraid I don't have the desaturated background image Crow made yet, though. I'll try to finish some of the missing details in this tileset, I would of done it yesterday but was preoccupied all day with a wedding. I see you've created obvious perspective platforms - the top, walkable surface of the platforms is visible, as if the camera is slightly tilted down. 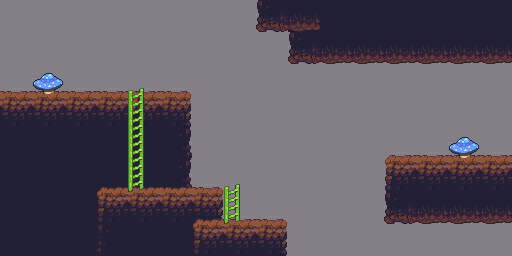 So far though, all walkable tiles are pretty much straight-on profile platforms. If these tiles are all meant to be used together, should they all be one or the other, and not a mixture? 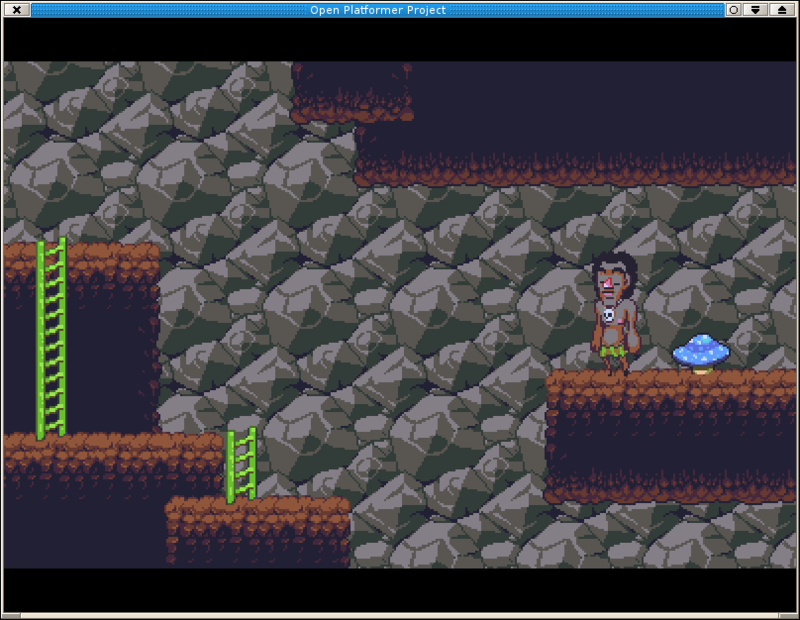 When I see those bg tiles, I immediately think Cave Story. If they're not lifted directly, they look like it, to me. I made a wip lava tile, well 2 I should probably turn down the details.